"Yes I Am, But Who Am I Really?" Queercore - a music movement of underground LGBT artists - was conceptually birthed in Bruce La Bruce and GB Jones' late 80s Toronto zine, JDs. In the years following, hundreds of like-minded publications exploded onto the scene, creating a global network of formerly isolated but newly united radicals. Founded on a punk rock platform, it wasn't long until zines became records, and a new generation of bands came to define the aesthetics and politics of the movement... a "musical fanzine." Goteblüd co-founder and curator Matt Wobensmith was there with his own zine and record label "Outpunk", documenting and supporting the nascent movement. "The zines in this collection are 'queer zines' by definition, but many of them are unique in that music and music culture is a common thread. People forget that prior to the internet, obtaining information on 'alternative' topics was difficult. The record store was where we went to learn and get exposed to new ideas. And we used music and record stores to find our audience - people like ourselves. Most of the zines were done by young people, and many are in the 'perzine' category, intended for a small group of sympathetic individuals. Alienation is a big theme; many of these zines' creators were just as disappointed by gay culture as the homophobia they encountered. 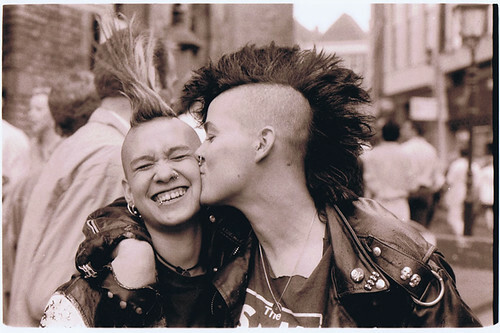 Queercore was about creating a new community, and exchanging survival tips and ideas. And though there was fun and celebration, it still remained quite serious. For many people, these zines were done out of urgency and a dire need to find others, to avoid an impending creative and psychic death." Also on display - alongside over 200 unique titles - are photos, flyers, posters, correspondence, clothing and skateboards of homopunk heroes. Goteblüd is a vintage zine store and gallery located at 766 Valencia, between 18th and 19th Streets in San Francisco. The show is open to the public on Saturdays and Sundays, from 12-5pm through late August, 2009. Wow... that's a large list. I have alot of those, and I know a fair many of the creators of these. I'm even surprised as to what's NOT on the list. "Bundle of Sticks" for instance had a dozen or so issues and was quite high profile in MPLS. Also, "Gentlewomen of California" was probably the single most mind blowing publication of my youth. I found 2 issues on my first visit to SF in spring '92. Larry Bob says there are more. For some reason it didn't occour to me that you would have issues of Salivation Army... I want! Sadly, even though I kept these zines safe in storage for years, I managed to lose a bunch. It really bummed me out, but who knows? They might turn up somewhere. "Bundle of Sticks" could have gone in this show. I tried to limit this show to zines with a musical thread. This precludes a lot of queer zines like "Gentlewomen of California" (which I have) because I had to draw a line somewhere. I left out a LOT of zines. It doesn't mean I don't like them. I just wanted to focus on "queercore." Then again, I broke the rules when I did my final selection process so who knows? Also, that's a great and totally on-the-nose show name. Thanks! It's appropriated from a Team Dresch song. this photo is making me miss Stacy a lot. I sure hope that I don't make people feel bad by using this picture. For those who don't know, this pic is of Stacy Quijas and Anou. I believe it was taken around 1991 or so. Stacy died ten years ago this week. She was a good friend of mine. We happened to have been born on the exact same day. We used to call each other brother/sister. I've always loved this pic. I think it's absolutely beautiful. The joy in her face says so much, to me. OMG you have Don't Dis Dolly? I have no more copies of that! Please to let me buy it. I may even have an extra copy, and if so, you ain't buying it. It's yours for the asking. This is all wonderful, congrats on your Bay Guardian piece. It's got a pretty avid following (and high signal to noise ratio!) for a community -- about two posts per day -- and some of their readers certainly live in the S.F. Bay area.